Welcome to the community of Moto E owners! A community for all Moto E owners! MotoEGuide.com is a community for Moto E owners, the most afforable (yet usable) smartphones in the market. You can share your experience, tips and tricks with other Moto E owners. The major news update on Moto E will also be covered. Of course, you can find reviews of Moto E, comparison of Moto E against other smartphones, and may other technical information on Moto E.
Get answers of your Moto E questions! The best Moto E how-to guide. MotoEGuide.com provides the best how-to guides on using your Moto E! If you have any questions or doubts on Moto E, check our Moto E how-to guide page! If the questions are not covered, leave you comments in this page or Moto E how-to guides page. We and other Moto E owners will try to find a solution for you! Read and download Moto E user manual! The Moto E user manual page provides the official Moto E user guide (in PDF format) in different languages. You can download the Moto E manual or read online. Find the best accessories for your Moto E! You have so many options of getting accessories for your Mote E that you cannot decide. Our Moto E accessories guide will show you how to get affordable accessories that meet your requirements. You get the most value from the money you paid! Any questions on Moto E or on MotoEGuide.com? Let’s know in the comment box below. 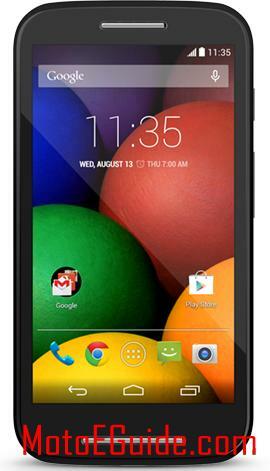 Moto e is awesome mobile with all facilities at affordable price. Would like to have assistance on preferred network type selection which is available in settings–>more–>mobile networks. There is no option to choose 3G only. By default switches between 2G&3G. So that browsing speed reduced. Am looking for the option 3G only mode. If someone helped on this would be really appreciable. 3g will always be used, 2g is for fail over when 3g is unavailable. Type *#*#4636#*#* in keypad and select WCDMA Only in preferred Network mode to choose 3G alone. What is “Encryption and Encrypt phone” and how it is useful? If you don’t know it, do NOT use them. This is trying to encrypting some data on the phone. But most people don’t need it. To add a widget, in the app drawer, tap and hold the widget to put it on the home screen. To remove a widget from home screen, tap and hold the widget in the home screen until the remove icon appears in the top of the screen. what is sync error when i connect play store. can’t we access whitout sync error.if yes plprovide. Can you use the SIM card in other phones? Did you try to switch the SIM card slot? Yes i tried in other phones, that time its working. When i used in Moto E first its showing enable after 3 to 5 sec automatically its showing disable. Signals also not reflecting in the screen. you may try the SIM card individually (i.e., leave the other SIM slots empty). You may try to insert the card again. If you trimmed the SIM card yourself, you may try to get an official Micro SIM card. Anyway, you may check with the phone company on possible card issues. It is normal depending on the activities and ambient temperature. Can moto e use tata docomo sim ? if your Moto G is GSM mdoel, then any GSM cards be used. Is the sim card activated? If you are using two sim cards, you can try to remove another one to see whether you have the same issue? 1. Switch off the phone & switch it on again. 3. removed the sim & inserted again. 4. Checked the ‘Settings’, I see “Mobile Networks” is disabled. You should disable aeroplane mode. You need check whether the sim card is inserted tightly. I am unable to choose my BSNL sim as preferred sim for data. Under sim cards tab, only airtel is fixed at this option. Please help. Did you check the dual SIM settings? I’m sorry, this is quite a challenge for me. Lost! May I return the Moto E phone? You need check with the seller or local Motorola office. This is a community site for owners to help owners only, and is not affiliated with Motorola. Do you check it with your phone company? Disabled means the sim card failed to register on the network. This could be a network or sim card issue. i am using that sim card for more than 10 years and it got registered successfully. it is not the card/network issue. checked in an service centre, they said the IMEI number got corrupted and nothing can be done. I am not sure how that happened!!.. planning to check with motorola service centre guys. is there any possibility to restore ? Not sure about actual situation. What did the guy mean that imei number is corrupted? You can check settings – about phone – status to find the actual imei number. Of course, you can visit Motorola service center indicated in the warranty card to check the phone. You should backup your phone before visiting them. Very likely, they need reset the phone first. If you want to try, you can also backup the phone and try a factory data reset. Both sims were disabled in my moto e. I can’t enable them. It doesn’t show any network. It is irritating from 2 days. If you remove one sim card, do you still have the same problem? Both sims were disabled in my moto e. I can’t enable them. It doesn’t show any network. It is irritating from 3 days. What happens if you insert only one sim? I am also getting same problem,This Moto is worst and this service centre also Please don’t buy…..
i have change sim tray but still this problem any one solution plz help me. What happens if you put only one sim card? Do both cards work? my mobile sim card slot not working (Also WiFi) from last two days. I have’t installed any apps during last 20 days. If you can share more details, other owners may help you. You can check shim card status in settings – about phone -status. I Have the same issue. I just checked the status and it says that even my IMEI number is unknown. How do i get the phone and wifi fixed. IMEI is required for most mobile networks. But it has nothing to do with Wi-Fi. If imei number is still empty or unknown, you should backup the phone and try a factory data reset. I tried everything like cache data wiping, reboot, factory data reset, and which is given by moto – finally it haven’t helped to me. So, can anybody resolve this problem……. If imei is null, most carriers don’t allow such phones on their new networks. Disable mobile data first, then change. My Moto e mobile sim are disabled???? How to solve the disable problem??? Not registered? No signal? Or not recognized? Your can try to power off the phone, remove the SIM card, insert it again and then reboot the phone. In my moto e phone both sim1 and sim2 has got disabled. Even the wifi options has been disabled. I am not able to enable it even after restarting my phone. For WiFi, what happens if you turn it on in Settings? For sim cards, is the phone compatible with your carrier’s between (GSM or CDMA)? No, only one 4G sim card is supported in Moto E. You can only use 4G+2G. The slot doesn’t matter.